One of the most frequent questions we get asked, both at Distilled and SEOmoz Q&A, is how a business should set up their website(s) to target multiple countries or multiple languages. The majority of the questions boil down to whether a site is better being on one big global website (.com) or whether there should be a website (local top level domain) for each country. 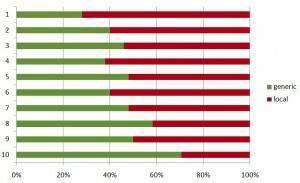 To help us answer this question, we wanted to take a look at the distribution of generic and local top level domains across the various regions - the theory being that generic domains are likely to be targeting multiple countries or languages, and that local tlds have been optimised for the local region. To get some relevant data, we ran a couple of experiments. First we took 50 random keyphrases (which were harder to generate than you might think!). We then looked at the top 10 results for these in Google UK, US, Australia and New Zealand. We then pushed all the keyphrases through Google Translate to translate them into Dutch, German, French, Spanish and Italian. With our translations in hand, we queried the relevant “foreign” Google (NL, DE, FR, ES and IT) and looked at the top 10 results for each. It’s worth pointing out that this experiment was run during the prolonged period of rubbish in the UK search engines. For this reason, this is the last you will hear of the UK results! On that note we are also ignoring the US results based on the fact that the .com has become synonymous with "American" and the .us local domain is all but irrelevant. Across the first page of SERPS in the sample keywords, there is a definite trend towards more local TLDs at the top of the results. 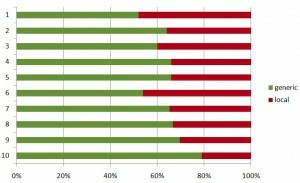 In the Australian SERPS, 75% of sites that ranked in position 1 have a local TLD, compared with only 25% ranking in position 10. You can draw your own conclusions, though please note there is a big difference between correlation and causation, ‘nuff said. Immediately, it looks like there is something different with the French and Spanish results. They both have a much higher percentage of generic domains than I would expect and also a much higher percentage of generic domains than you see in NL, IT and DE. My best guess as to why this is the case is that historically it was much harder to purchase .fr and .es domains due to tight restrictions on registrations. This graph, sourced via dnjournal shows what happened when the restrictions were lifted in 2004. Obviously, by that point there were a lot of generic (mainly .com) domains targeting the French market. These domains will have built up history, trust, links, etc., and many a webmaster will have stuck with a .com rather than switching to a .fr. It's worth noting that these generic domains, contrary to our hypothesis, are targeting one language rather than targeting a global market with multiple languages. 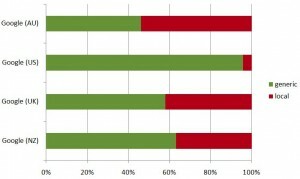 Take a look at the results for “apprendre le php”. The entire first page is full of generic domains entirely in French. 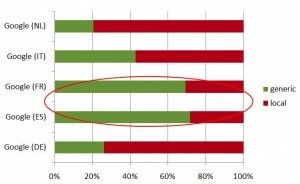 Compare this with the results for “php leren” in Dutch, where only one of the top 10 results is a generic domain. If we could look again at the SERPS and plot the number of sites with a single language (even if they are on a generic .com domain) then I'm sure we would see an even more compelling graph with the majority of sites being single language. I think this is the crux of the matter. Rather than talking about generic vs local tlds, we should be talking about whether you should have one website targeting each country or one big global site that holds all your content and targets all the relevant countries. I would always vote that having one website per country will - in the long run - out perform one generic site targeting all the relevant countries and languages. Things are never that simple, however, and as I’m sure you’re all aware, you can't always have one site with a single language per country. There are many countries where many languages are spoken, i.e., Belgium has three official languages. In this example, I would set up one website targeting Belgium, and within the site I would have a folder for each of the three official languages. Whilst I think this the data is informative and useful, it's worth pointing out that there are some definite flaws that could invalidate the data. Firstly, to save time we chose to use Google translate to translate the 50 source keywords. We would never recommend a client uses anything other than a native speaker to do keyword research, but I think in this case the impact on the results was probably negligible. 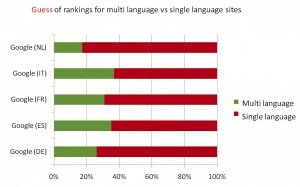 Secondly - and certainly more likely to have had an impact - we only looked at a sample of 50 keywords in each language. Only with a dramatically increased sample size can we really be confident that what we are seeing isn’t just a random quirk of the data that was chosen. Having said that, personally I’m inclined to trust the data (which is possibly because it agrees with what I already thought! ).